It’s time for another Splatoon-themed event in Animal Crossing: Pocket Camp (Free)! The Clam Blitz hunt is still underway, but that hasn’t stopped Chip from showing up at Saltwater Shores and asking that you catch him some delicious neon-colored goodies from the sea. 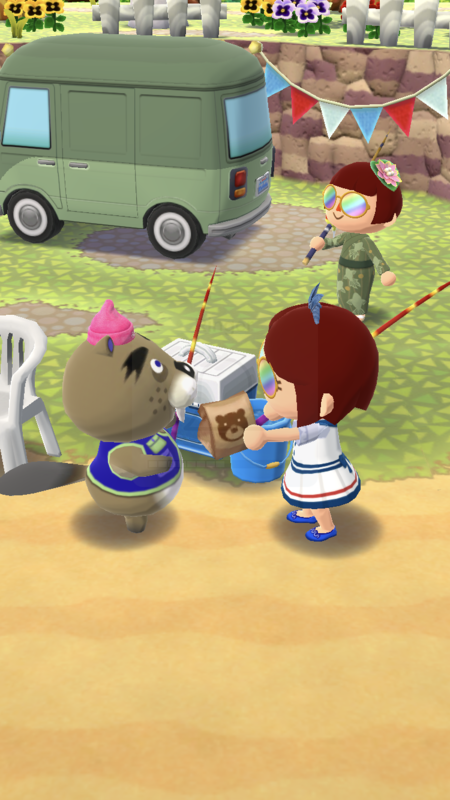 He’ll reward you with themed furniture and clothing as you catch his meals, adding to the items already available from the scavenger hunt and fortune cookies. Fishing Tourney #6 is dripping with Splatoon style, but runs as a normal fishing tournament would in Animal Crossing: Pocket Camp. Every three hours, the game switches out visitors, quarry items, etc., and also resets tournament fish. Tournament fish appear sparkly in the water. Every now and then, you’ll get lucky and catch two at once; for a permanent double-boost, you can purchase a Golden Rod from Chip for 80 Leaf Tickets. In this Fishing Tourney, you’re catching neon squid and octopus in search of the event-exclusive Squid Trophy. There are pink and green quid, and purple octopuses (octopi? That’s a debate for another time). There are two ways to earn rewards, by reaching total size goals (what your entire tournament catches add up to) or by completing event challenges. Furniture is earned through total size goals, whereas clothing can be earned in both ways. For furniture, in addition to the trophy (which will be sent to your mailbox following the tournament and only available for a couple days), you can earn two green squid dummies, two pink squid dummies, and one super sea snail. The clothing rewards continue the clothing line you can earn via the Clam Blitz, meaning you can really go all-out when it comes to decking out your character in Splatoon gear. If you finish every single goal, you’ll finishing the tournament with three green king flip mesh caps, one pink king flip mesh cap, three green knitted splat hats, five (!) pink knitted splat hats, and two Takoroka windcrusher jackets. Don’t forget that there is still one more Gift For All remaining, the squid parka on September 23. You should also still be able to grab the squid shirt; both appear in your mailbox for a limited time. The Clam Blitz Scavenger Hunt continues to September 25, and Fishing Tourney #6 runs until September 26. The fortune cookies are available for a little bit longer, until October 11.